A diving support vessel with about 100 people on board which ran aground on rocks at Lerwick harbour has been refloated. The Bibby Topaz was heading to the Gryphon oil field at about 0300 BST. 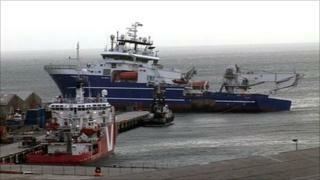 A Shetland Coastguard spokesman told BBC Scotland a tug had been sent to assist with the 106m-long vessel. A spokesperson for Aberdeen-based Bibby Offshore said: "None of the crew were injured and there has been no outflow of fuel or other pollution." The spokesperson added: "The vessel will undergo a detailed inspection to assess any damage that might have been caused by the grounding. "Bibby Offshore would like to thank the authorities for their assistance in this matter." The cause of Friday morning's incident is being investigated.